Mongolia defended its IIHF Ice Hockey Challenge Cup of Asia title after a 6-3 victory over the Philippines in the tournament final in Kuala Lumpur, Malaysia. The Philippines had caused an upset in the group stage, defeating Mongolia by the same 6-3 scoreline and threatened a repeat in the final when it battled back from 0-3 down to tie the game before losing out in the third period. A hat trick from Bayarsaikhan Jargalsaikhan led Mongolia’s scoring, Gerelt Ider picked up 1+1 to finish as the tournament’s top scorer on 17 (11+6) points from five games. That title defence got off to an assured start with Mongolia jumping into an early lead. Jargalsaikhan opened the scoring in the eighth minute after a solo rush from #22 opened up the Filipino defence. Just 30 seconds later, Mongolia had a second: Erdenesekh Bold took the puck out of the corner, fed it to Enkhsukh Erdenetogtokh at the point and moved to the slot to convert the rebound from the defenceman’s shot. Ider made it 3-0 late in the opening frame with a one-timer from in front of Paolo Spafford’s net off a Jargalsaikhan feed. But the Philippines hit back. Julius Santiago’s 22nd-minute effort was the only marker in the second period; two goals in a minute at the start of the third tied the game up at 3-3. First, Carl Montano’s pass from behind the net was gobbled up by Jose Cadiz, then Jan Regencia stuffed home the rebound from a Benjamin Imperial shot. Montano and Regencia both had previous against this opponent, having scored two apiece in the group game; now they had thrown the final wide open once again. Within a minute, Jargalsaikhan had restored Mongolia’s lead; 63 seconds later Ider set up Erdenesukh Bold to make it 5-3 and with 10 minutes to play Jargalsaikhan completed his treble to put the game beyond the Philippines’ reach. Earlier on Saturday, the host nation took on Singapore in the bronze medal game. However, the home team was unable to finish with a medal thanks to a fine goaltending performance from Kenny Liang. He made 23 saves to claim a shut-out as Singapore skated to a 4-0 win. James Kodrowski scored twice, Bryan Lee had a goal and two assists, Jiaju Ryan Tan was the other goalscorer. The tournament format saw four teams – Mongolia, Malaysia, the Philippines and Singapore – contest the Elite group with three others playing in Division 1. After a round robin with each team meeting twice, Indonesia came out on top ahead of Macau and these teams progressed to the quarter-finals against the two lowest-ranked Group A nations. Oman finished third in a tight group; the Middle Eastern nation’s competitiveness was emphasized by a goal differential of -1 despite three losses in four games. Singapore and Malaysia overcame Indonesia and Macau respectively in the quarter-finals, but neither could progress through the semis. The Philippines beat Singapore 6-1 before Mongolia downed the hosts 12-6 to set up Saturday’s medal games. A similar competition in Austria saw Denmark come out on top. The Danes were impressive on defence throughout the event, allowing just three goals in three games. Cassandra Repstock-Romme, Amalia Joa and Lisa Jensen shared the goaltending duties and each allowed one goal. At the other end, Josefine Jakobsen (4+3) and Nicoline Jensen Sondergaard (1+6) led the scoring as Denmark enjoyed 3-1 wins over Austria and Italy and 5-1 success against Kazakhstan. The Italians took second place after defeating Austria in the last game of the competition in Tefls. Kazakhstan failed to get a single win. Jaakko Rissanen scored in the eighth round of a shootout to give Finnish club KalPa Kuopio a 2-1 win over three-time defending champion Canada in the final of the Spengler Cup on Monday. KalPa goalie Denis Godla led his team to a 3-2 shootout win against Canada netminder Zach Fucale and his squad. Rissanen beat Fucale with a high backhand before Godla made a pad save on Canada captain Andrew Ebbett to end it. The shootout was tied at 2-2 following three shooters each, bringing it to sudden death. Godla — the MVP of the 2015 world junior championship when he lifted Slovakia to a bronze medal — made five straight saves for the win. Canada fell just shot of matching its run of four consecutive Spengler Cup titles from 1995 to 1998. Daniel Winnik opened the scoring for Canada in the third period before Eetu Luostarinen tied it. 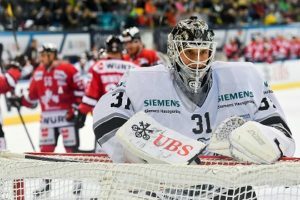 It was KalPa’s first Spengler Cup title in the history of the annual holiday tournament. At the 92nd Spengler Cup, Team Canada easily qualified for the final which will take place on Monday (12:00 noon). Led by the outstanding Zack Boychuk, the Canadians won 4-2 against the Thomas Sabo Ice Tigers on Sunday afternoon. 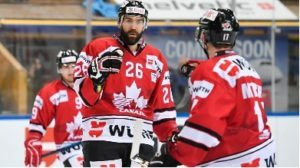 Team Canada’s victory against the Ice Tigers indicates they are on their way to successfully defend the title at the Spengler Cup. With this 16th tournament win, they could take over the sole leadership of the winner statistic. The basis for their semi-final victory against the Germans was set early by the Canadians – in the first period – led by Zack Boychuk. 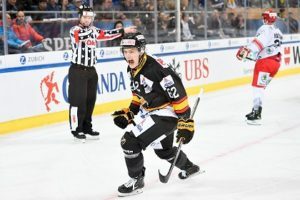 The 29-year old forward, who joined SC Bern from Sevestral Tscherepovets (KHL) during this season and who also played in the successful team at last year’s Spengler Cup, arranged for the early 3-0 lead in the first period. He prepared the first goal with a pass to Cory Emmerton, then sunk the next 2 goals himself. The Germans never gave up, even when they were clearly behind – Chris DiDomenico increased the lead to 4-0 in the 23rd minute. They showed excellent morale and lots of fighting spirit. In the last period, they were able to reduce the lead to 2-4 thanks to goals shot by Daniel Weiss and Brandon Buck. The Nürnebrgers pleased the crowd with their strong ice hockey at their premiere participation at the Spengler Cup. The highlight for the Germans was their surprising 3-1 victory against Metallurg Magnitogorsk. 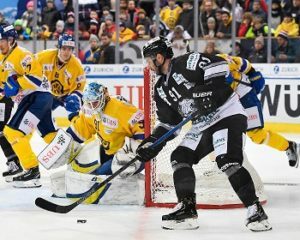 In the fastest-paced game of the 92nd Spengler Cup tournament, HC Davos fell short in the semi-final game against KalPa Kuopio on Saturday evening. Yannick Frehner was able to equalize the game for the home team in the 46th minute, but just 5 minutes later Jaakko Rissanen re-took the lead for the Finns 2-1. They will play in the finals for the first time on Monday at noon against the defending champion Team Canada. The Finns started the game like a display of fireworks. Thanks to the exceptional skating skills of all their players, KalPa put so much pressure on the home team that they barely got the puck out of their own zone. The logical result was KalPa’s go-ahead goal after only 131 seconds resulting from a long shot by Kim Nousianen. The Davos team needed quite a bit of time to adjust to the relentless assault by the guests. This was confirmed by the statistic: in the first 11 minutes HCD goaltender Gilles Senn had 11 shots-on-goal to deflect, during the rest of the period only once more. The intermediate result after 40 minutes was 1-0 for KalPa Kuopio. However, the spectators had absolutely no cause to complain that it was a boring game. Both teams delivered an enthralling, offensive slugfest with many scoring opportunities. The shots-on-goal ratio was 8-8 in the second period, the puck narrowly missing the goal posts often while the players made daredevil shots. The host team finally made it work in the 46th minute. The 20-year old Yannick Frehner, member of the young 4th block, sunk the puck to make it 1-1. Shortly thereafter the Davos team missed several chances to take the lead during the only power play situation. The opponents did it better. Jaakko Rissanen completed a counterattack after receiving an ideal cross pass from Alexandre Texier 2-1 and secured the final ticket for the Finns. Metallurg Magnitogorsk – the most frequently named challenger of the defending champion Team Canada – must pack their bags and depart. The Russians surprisingly lost their quarter-final game against the Thomas Sabo Ice Tigers from Nürnberg 3-1 on Saturday afternoon. The Germans now face Team Canada in the semi-finals on Sunday afternoon (3:10 pm). The Ice Tigers deservedly beat Metallurg Magnitogorsk with their aggressive, hands-on efficient and strategic performance. They effectively steered the game to their advantage. After just 246 seconds of play, the Captain Patrick Reimer shot the go-ahead goal. At the beginning of the second period, Metallurg’s top-scorer Nikolai Kulemin equalized the game in a power play situation. However, just about 5 minutes later, Brandon Buck also took advantage of a player majority and reinstated the lead for the Germans 2-1. Just prior to the end of the period, Leonhard Pföderl sunk the 3rd goal for the Ice Tigers in a training manual counterattack. Thereafter, the Nürnberger successfully defended their lead. Goaltender Niklas Treulte proved his reliability and absolutely faultless support. He deflected 29 shots-on-goal, resulting in a defensive quota of 96.67 percent. In the last 4 minutes of the game, the Russians played with 6 on the ice and during 67 seconds were even in double majority to attempt to turn the tide. Their several attempts failed against Treutle, their offensive strikes were mostly harmless. In the 3 games, the team only achieved 2 goals, one of which was the winning shot during the penalty shoot-out against Trinec. The surprising poor performance of Metallurg Magnitogorsk is in line with the disappointing representation of the teams from the Kontinental Hockey League (KHL) in recent years – supposedly the best league outside of the North American NHL. Since the tournament win by SKA St. Petersburg in 2010, 12 KHL teams have participated at the Spengler Cup. Only 3 of them were able to win at least 2 games at the same tournament. HC Davos will play against KalPa Kuopio on Sunday evening (8:15 pm) at the Spengler Cup to decide who qualifies for the finals. The home team secured their qualification for the semi-finals with their victory against the Czech championship leader Trinec 3-1. Double-scorer Linus Klasen and goaltender Anders Lindbäck stuck out amongst the strong HCD squad. The Czechs began by resolutely dictating the game. The Davos team only gained momentum during the two penalties against Trinec, although they were unable to create any real goal chances. Both teams then switched from primarily defensive to offensive play, providing the 6,300 spectators with a fantastic match-up with many scoring opportunities. Determined, Linus Klasen scored a goal after receiving a pass from Dario Simion in the 15th minute to give Davos the lead. Several penalties hindered the flow of the game in the second period. The home team came increasingly under pressure and the goaltender Anders Lindbäck became the center of attention. Tino Kessler missed making it 2-0 when he attempted a speedy counterattack. Due to the flow of the game – 9-4 shots-on-goal for the Czechs – it seemed only a matter of time until the equalizing goal would happen. After an advance by Trinec Captain Lukas Krajicek and his cross pass, Ondrej Kovarcik was able to land the puck in the net shortly before the end of the second period to make it 1-1. At the beginning of the last period it was obvious that HCD was back in the game. Both teams intensively sought to decide the game which led to a spectacular slugfest with many scoring opportunities and exceptional defensive maneuvers by both goalies. Klasen emerged as the match winner. After a shot-on-goal by Ambühl, the Swede reacted the quickest and scored on the rebound. The Czechs answered fiercely but failed to beat the exceptional HCD goaltender Lindbäck, who defended 27 shot-on-goal during the entire game. Dino Wieser scored an empty netter almost exactly as the game-ending siren rang. 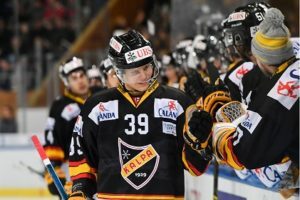 KalPa Kuopio produced the first upset on Friday afternoon at the 92nd Spengler Cup. The young Finns beat Metallurg Magnitogorsk. The only goal was shot by Tommi Jokinen in overtime after 167 seconds. Pure suspense throughout the last game of the Torriani group. The game was an offensive extravaganza because both teams were well-organized, disciplined and took few risks. In addition, both goaltenders intervened successfully in the rare precarious situations during the regular game time, allowing no goals to be scored. A 0-0 after 60 minutes has not happened at the Spengler Cup in a very long time – not since the introduction of the finals in 1986. Only during overtime – where 3-on-3 players compete – were the Finns able to score the only goal. Otto Leskinen superbly out-maneuvered so that KalPa’s Captain Tommi Jokinen could beat Magnitogorsk’s goalie Artem Zagidulin in the 62:47 minute of the game. The Finn Daniel Manzato was able to celebrate a shutout. The Ambri goalie is assisting KalPa Kuopio at the Spengler Cup due to Jonathan Iilahti being injured. With this win making them group leader, the Finns qualify directly for the semi-finals on Sunday. Metallurg Magnitogorsk will have to take the indirect route via the quarter-finals on Saturday. The opponent from the Cattini group will be known after tonight’s match-up between Team Canada and the Nuremberger Ice Tigers. The Russians are paying the price for reserving their key players such as Viktor Antipin, Nikolai Kulemin, Matt Ellison, Jewgeni Birjukow and Dennis Rasmussen. Dante Fabbro scored twice to help power Canada to a 6-2 victory over the Nurnberg Ice Tigers on Friday, capping round-robin play at the Spengler Cup. The Canadians play the winner of Saturday’s quarter-final between Metallurg Magnitogorsk and the Ice Tigers on Sunday. Metallurg finished second in its group with three points on an overtime win and an overtime loss. At their Spengler Cup debut on Thursday afternoon, KalPa from Kuopio won 3-1 against Ocelari Trinec. Alexander Ruuttu dazzled as the first player to shoot 2 goals in one game. 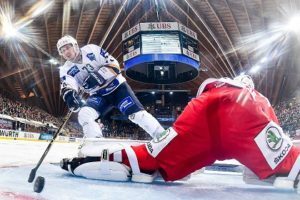 The young Finns from Kuopio and the Czech league leader Trinec provided a typical Spengler Cup match-up – exactly as the spectators love – offensively with lots of tempo and numerous goal opportunities, following the motto “play and let play”. That only 4 goals were scored is primarily thanks to the efforts of the KalPa goaltender Denis Godla. The 23-year old in the Finnish net – who played for Slovakia at the World Championships last season – kept his team in the game with his spectacular saves. He deflected 29 out of 30 shots-on-goal, giving him a defensive quota of 96.67 percent. At times it seemed the Czechs were careless with their goal opportunities. The first goal was scored by Alexander Ruuttu when he accepted a fantastic straight pass from Jaakko Rissanen (13th minute). The scorer has ice hockey in his blood: his father Christian Ruuttu participated in 663 NHL games. Towards the end of his career, he played for the Grasshoppers in the B National League during the 1996/97 season. When the defender Martin Gernat shot the equalizing goal for the seemingly overpowering Czech team in the 33rd minute, the spell seemed to be broken. But only 53 seconds was needed by Alexandre Texier to take advantage of a defensive mistake by Trinec to counterattack and take the lead 2-1. Ruuttu sunk his personal second goal just 32 seconds into the third period to decide the game. 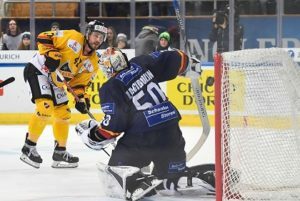 In an absolutely spectacular game, HC Davos wins against the Thomas Sabo Ice Tigers 3-2 at the Spengler Cup Thursday night. The Germans caught up after falling behind 0-2. The winning goal was shot by the 18-year old defenseman Julian Payr in the sold-out Vaillant Arena. Game winner for HCD was also the outstanding goalie Gilles Senn. 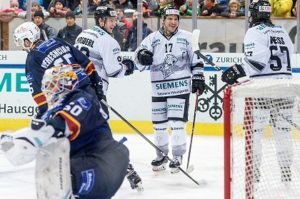 After Davos began its last 3 games under Coach Harijs Witolinsch by falling behind in the first period each time, they started the game against the Ice Tigers powerfully. Their intense concentration in the first period paid off with 2 brilliant goals. Inti Pestoni, elegantly and with lots of speed, skated around Nuremberg’s defenseman Marcus Weber before he left the goaltender Niklas Treutle no chance to deflect (6th minute). Just 64 seconds later Dario Simion completed a textbook combination from Andres Ambühl via Niklas Klasen to sink a direct pass into the net. Taking advantage of a power play situation at the start of the second period, the Germans found their way into the game. Senn became the focus. He displayed his best defensive maneuvers against Chris Brown and following the end of a penalty also against Chad Bassen, both solo attacks. 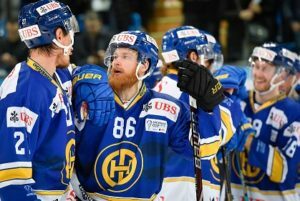 For HCD Coach Witolinsch it was clear that the time had come, in the 26th minute, for a timeout to bring the Davos team back into the game. The result was a more open, spectacular slugfest with many scoring opportunities for both sides (13-14 shots-on-goal in the second period alone). Brandon Buck scored in a counterattack to reduce HCD’s lead to one (37th minute). In an enthralling final period, the Olympic silver-medal winner Leo Pföderl increased the intensity of the game by scoring the equalizing goal during a power play situation for the guests (49th minute). Of all the players, it was the youngest on the ice that landed the deciding puck in the net. The 18-year old HCD defenseman Julian Payr scored after receiving a cross pass from Klasen. Senn defended his team’s narrow lead for the remaining time. The HCD goaltender demonstrated his magnificent skills. He deflected 33 shots-on-goal and was selected as Davos’ best player of the game. Tournament favorite Metallurg Magnitogorsk had a tough time against the well-organized Trinec team in the first game of the 92nd Spengler Cup. Maxim Matuschkin shot the equalizing goal only in the 53rd minute for the Russians to make it 1-1. In the resulting penalty shoot-out only Roman Ljubimov landed the puck in the net for Magnitogorsk. Goals were rare in the opening game of the 92nd Spengler Cup, although there were many attempts. The 5,359 fans in the Vaillant Arena enjoyed the extremely engaging match. Both goaltenders – Simon Hrubec (Trinec) and Artem Zagidulin – hat several chances to demonstrate their expertise. While both teams demonstrated not only their superb organization but also their skating skills and tactical training. With a practiced powerplay maneuver, Trinec took the lead. Martin Adamsky deflected the hard-hit pass from defender Vladimir Roth into the net (23rd minute). Immediately prior and also thereafter Martin Ruzicka failed in his quick solo counter attacks against Zagidulin. In the third period, the Russians increased their offensive pressure as is clearly shown in the shots-on-goal statistic 12-5. Only Maxim Matuschkin was successful in beating Hrubec (53rd minute). After a goalless overtime, the penalty shoot-out was needed to force a decision. Trinec brought in Petr Kvaca for Hrubec at this point. He was overpowered by the first penalty shooter, Roman Ljubimov. All subsequent penalty shooters failed. Trinec’s Ruzicka had an unlucky shot that hit the goal post. Kvaca was also unlucky when he injured himself during his successful defense of the penalty attempt by Matuschkin. Zach Boychuk opened scoring for Canada, while Zach Fucale made 18 saves for the win. Thierry Bader ended Fucale’s shutout with less than two minutes remaining in the second period and Anders Lindback stopped 24 shots for HC Davos. As Europe’s top teams prepare for April’s IIHF Ice Hockey Women’s World Championship, Olympic bronze medallist and World Championship host Finland dominated a four-team tournament the country hosted in Vierumaki, Tampere and Hameenlinna. Newcomer France enjoyed a win over Russia in Pribam, Czech Republic, while Japan guested on the Euro Hockey Tour and earned victories over Finland and Germany. The host nation tuned up for this season’s Women’s World Championship – also to be played in Finland, in the city of Espoo – with an impressive display against its European rivals. The Finns were faultless here as they saw off the challenge of Germany, Sweden and Switzerland. However, there was a surprise overtime loss against Japan, invited as a guest team to help its preparations for the Worlds. The Japanese won their first two games and gained valuable experience ahead of April’s big event. Finland’s success was dominated by players from its bronze-medal roster in PyeongChang back in February. Leading scorer Michelle Karvinen picked up 6 (2+4) points and blueliner Ronja Savolainen had 5 (4+1) and finished as the top goal scorer. Germany proved to be Finland’s closest challenger, opening with a 4-2 win over Sweden and edging the Swiss in a shootout. However, the team missed its chance to top the group when it crashed to a 6-1 defeat against Finland in its final game. Four unanswered goals in the first period, two of them from Savolainen, paved the way for an emphatic home win. The Swedes got off to a fast start with a 7-0 victory over Switzerland – Hanna Olsson, 19, scored a hat trick and highly-rated young defender Maja Nylen-Persson had three assists – but the Damkronorna could not maintain that momentum. Switzerland came fourth among the European nations with just one point from a shootout loss against Germany to show for its efforts. However, the Swiss became the first team to defeat the Japanese guests, winning 2-0 thanks to goals from Alina Muller and 16-year-old defender Sinja Leemann. Muller made her 100th appearance for the national team in the 1-4 loss against Finland and marked the occasion with a goal. For Japan, there were eye-catching contributions from Miho Shishiuchi, Haruna Yoneyama and Rui Ukita. Shishiuchi led the team’s scoring with 3+1, including two goals against the Finns. Yoneyama’s two goals paced the Japanese to its 4-1 success over Germany, while Ukita got the overtime winner against the host and had three helpers. All three forwards were part of the Olympic roster last February. The next phase of the Eurotour will be played in Russia in February before the teams will meet again at the 2019 IIHF Ice Hockey Women’s World Championship, 4-14 April 2019 in Espoo. The Czech Republic came out on top in a four-team tournament in Pribam, taking gold ahead of Norway after the teams tied on six points. It all came down to the head-to-head meeting, and the Czechs skated to a 2-0 verdict. The home defence put in a strong performance to limit Norway to just 13 shots at Kristyna Blahova’s net but in a tight game there was no score until midway through the third period. Tereza Vanisova got the winner in the 48th minute, Noemi Neubauerova added another in the last second. Norway also finished on six points thanks to wins over Russia (2-1) and France (2-0). The French, preparing for a first ever campaign in the top division of the World Championship in April, took third place thanks to a 3-1 victory over Russia. After falling behind to Tatyana Chizhova’s second-period goal, Les Bleus recovered in the third to win thanks to a double from Chloe Aurard and a late clincher from Betty Jouanny. For France, this was a first victory over a Russian team ranked fourth in the world. Russia, using an experimental roster heavy on players from last season’s U18 Women’s World Championship roster, found life difficult against more experienced opposition. After defeats against Norway and France, the Russians gained some consolation on the final day with victory over the Czechs but remained in fourth place in the group table. Two exhibition games in Zeltweg between Austria and Slovakia ended with 5-2 scores. First the Slovaks won thanks to a Janka Hlinkova hat trick, the day after Austria took revenge with the same score.